I was completely inspired by a recent article in “Pathways to Family Wellness”, the magazine you often find in chiropractic offices. The topic of reclaiming birth was powerfully written in this piece. The fall 2015 cover grabbed me with this title. 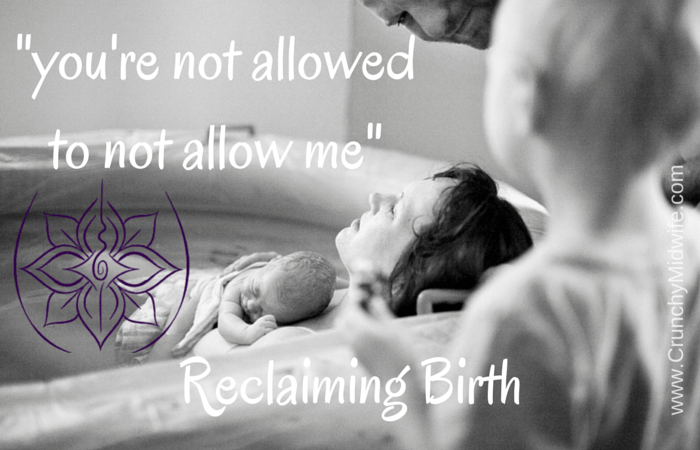 “You're Not Allowed to Not Allow Me: Reclaim the Power of Birth” written by birth advocate and Vice President of ImprovingBirth.org, Cristen Pascucci. What a profound title! Cristen's voice is that of a true protector of normal birth and she highlights a foundational problem in the current maternity care system in the US. Who owns your birth? For that matter, who owns your health? Who has the most to gain and the most to lose besides the birthing woman? Who, above all else, has the baby's best interest at heart besides her mother? Even in 2015, I hear care providers, family members and even the pregnant woman, herself, use the word “allow” in conjunction with basic human rights. Rights such as holding your baby immediately after birth. The word, “allowing” implies power and who rightly holds the power over your body, pregnancy, birth and baby except you? When a well-meaning provider makes a controlling statement such as, “we don't allow eating or drinking in labor” or “we can't allow you to walk around in labor after your water is broken,” a birthing woman often mistakenly assumes that these statements are based on medical facts. Often, that opinion is purely a practice-style or a hospital policy. It's definitely not based in evidence or even best practice guidelines. In medicine, It's generally known that it takes anywhere from 10-20 years for practitioners to fully adopt changes, based on evidence resulting from studies. Old habits die hard, and beyond that, hospital policies are not primarily set up to support the evidence. Instead, hospitals are set up as businesses with a business focus. You are a consumer and should be treated as a partner in your care, not a ward of the system. Imagine for a minute, your partner not “allowing” you to do something. In a relationship, we would think of this as control and abuse, yet we blindly accept this language as “the way things are” in the "medical model" of maternity care. Ms. Pascucci references the 2014, American College of Obstetrics and Gynecology’s (ACOG) and the Society for Maternal Fetal Medicine's (MFM) Guidelines for lowering the primary c-section rate. As a South Carolina midwife who practices the “midwive's model of care,” these words are, on one hand, a welcomed relief. They confirming what midwives already know. On the other hand, they are quite maddening for the reasons of control mentioned above. Midwives primarily trust and support the physiological process of birth as it unfolds. We begin with very important conversations with our clients early on, in your prenatal care. We teach you what it means to take responsibility for your health. We offer information on nutrition, exercise and lifestyle choices so you can will make a significant difference in keeping your pregnancy low risk. You don't just roll out of bed one morning and decide to go run a marathon! You train for it. You give your body every opportunity to succeed. Birth is the same. The midwive's model of care empowers you by sharing all of your options with you. Most women, when offered education and understanding on the benefits, risks and alternatives of their choices, will make the absolute, best decisions for themselves and their unborn baby. “Allowing” women more time in labor and birth is great but it's really only one piece of the care that women deserve. To be truly empowered in “Reclaiming Birth,” you must come to the understanding that every choice you make up until that birth, will have the potential to affect your birth. This piece of the message from ACOG and the Society of MFM is missing. As the article goes on, it discusses the fact that the national c-section rate is still climbing and that many hospital's in the US have effectively banned vaginal birth after cesarean (VBAC). In essence, they've made policies that do not “allow” women to birth vaginally, even if that's their decision. One out of every three women who walk through the doors of a US hospital will end up with major abdominal surgery to birth their child. In some hospitals, that statistic is much higher. Some as high as 70%! Many of these c-sections would not have become medically necessary if women were able to make true informed choices based on the evidence currently available and given prevention-based care and education. Again! Are we teaching women how to stay low risk, become aware of how their positioning affects their baby's position and offering trust their body's ability to birth or are we still setting them up for the repeat cesarean based on old school thinking and practice? The medical model of maternity care has dropped this ball mainly due to a well founded fear of liability. True informed consent or, alternately, informed refusal is a legal and ethical standard. You are given the details of procedures and interventions and also given the ability to accept the medical advice and procedure or to refuse it without stern lectures or fear tactics. It is not ethical or fair to pull the "bad mom" card just because your decision may not agree with a doctor's opinion. When a true medical emergency exists, I have not encountered even one mom who would refuse medical intervention. Can I get an AMEN!!?? This statement is completely opposite to the common "medical model" mindset of being “allowed to (insert your pleasure)” or “not allowed” to decline potential, harmful interventions and treatments such as surgical birth. Or how about this one? "Once a c-section, always a c-section" or the now infamous VBAC bans? Again, I encourage you to check the facts. I invite you to check out the Pathways article referenced above as Ms. Pascucci has some great action points to implement. We will all need to work together to change the dysfunction in the birthing culture, towards a more woman-centered model. Here are a few more tools for changing the birth culture, beginning with your birth! You have the right to complete information as you choose your care provider, your place of birth and each and every procedure that is offered. Speak up for your own birthing rights and Reclaim your birth! The terrain that you plant your baby in is very important. Make sure your internal bio-terrain (your body) is in great health by focusing on nutrition, environmental factors, excellent supplementation, exercise and stress reduction to stay low risk. Choose your care provider wisely. Interview people! You are the consumer and in the driver's seat. Whether you choose a medical model or midwifery model care provider, make sure you communicate your preferences and ideals and ask for their help to get what you need. Their language will tell you a LOT! Don't fall into the “eating for two” trap of poor eating. Make 95% of your diet intentional, healthful and life giving. Read and make an intentional plan for your birth. Tell your care provider about the things that are the most important to you and again, ask for their help to get what you need from your birth. Don't fall into the induction trap. Read, do your research and understand that a “failed induction” equals a c-section! Avoid that first one by knowing how to stay low risk. There are very few legitimate induction exceptions. It's ALWAYS about weighing benefits vs. risks. Use this simple acronym to make sure you always have the ability to make informed choices or informed refusals on any intervention being offered. B- Benefits. What are the benefits of the intervention being offered? R- Risks. What are the risks of the intervention being offered? A- Alternatives. Are there alternatives to the intervention? I- Intuition. What does your gut or your intuition say? N- Nothing. What would happen if you chose to do nothing? And remember! In most situations in labor, you can ask your care provider to step out of the room so you and your partner can discuss things in private after you've had a chance to gather the facts. In my experience, women are most interested in the health of their babies, BUT they are also very interested in their birth experience and how that experience will affect their bonding, their long term mental health and their relationship with their child, forever. Some very insensitive practitioners have tried to hold on to the "power grab" by discounting a women's innate need to have their best birth "experience." This is sometimes done by ridiculing a woman's desire for a beautiful birth and playing that "bad mom" card if one desires more than the standard birthing fare. Don't settle!​ Many women are finding their voice and reclaiming birth. If you encounter this type of care, I don't care how far along you are, Seriously consider switching providers. Most women will give birth only a handful of times in their lives and you deserve to have competent yet respectful care. Find someone who can offer you the care you need, so you can trust that they will support you in birth, the way you deserve. In the end, everyone's goal is a healthy mama and a healthy baby. However, in this day and age of liability driven birth care, the responsibility falls squarely on you. Know your provider options and the benefits and the risks of your choices to get the best outcome for you and your baby. Interested in Creating YOUR Best Birth? 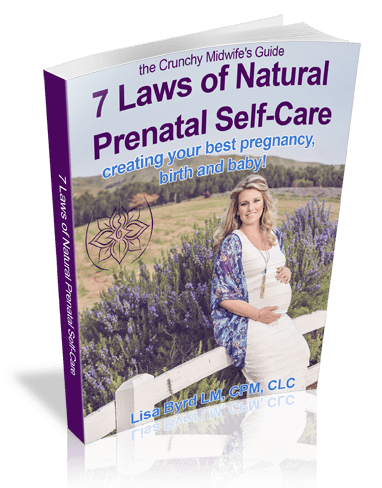 7 Laws of Natural Prenatal Self-Care Here! Lisa Byrd LM, CPM Lisa is a healthy mama/baby crusader and a "crunchy midwife" in Columbia, SC with a passion to help families create a safe, non-toxic home for their families. She's is a mom to 5 amazing adults and "Gigi" to 5 beautiful granddaughters and 1 incredible grandson. She lives and works in Columbia, SC where her home birth practice thrives. Lisa travels to Charleston, SC, Greenville, SC and Charlotte, NC to teach classes on reducing toxicity in the home. When she's not catching babies, creating clean, fun concoctions in her lab (ehem, kitchen) or teaching natural health care classes, you'll find her playing in her metal arts studio or soaking up negative, life giving ions at the beach. "We are all on a health journey. The key is keeping it simple and finding joy on your journey!"